These two Houdini advertisements date to 1915. Most of the ads run by Keiths or the Orpheum chains are pretty much the same. But every now and then they'll really push Houdini's appearance with additional graphics. The above image is from the Providence Rhode Island Keith's Theatre. This next image is from October 1915 and is for the Portland Oregon Orpheum Theater. 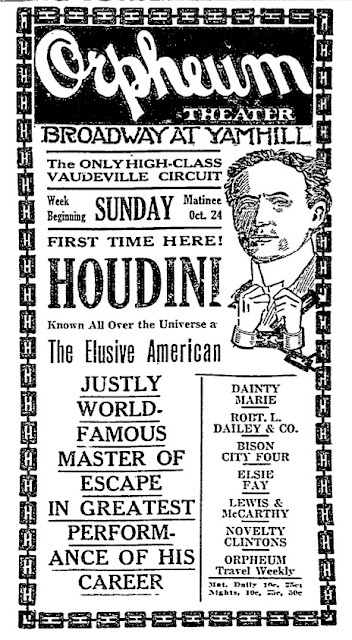 Again, Houdini's billing takes up most of the ad, with the supporting acts relegated to the lower corner. This particular theater was torn down in 1976 to make way for a Nordstrom's Dept Store. "Known all over the universe" ... I'll bet I can guess who came up with that one! Fair enough though. In the first one, does it say "Marconi Brothers - Wireless Musicians" or did I read that wrong? This stuff is so good. Thanks for posting. IT does say Marconi Brothers, Wireless Musicians!